Powerful yet gentle, this innovative tonic water helps capture and lift away dirt, oil, impurities and makeup without harsh rubbing or even rinsing. Leave skin feeling clean, hydrated and refreshed without over-drying. 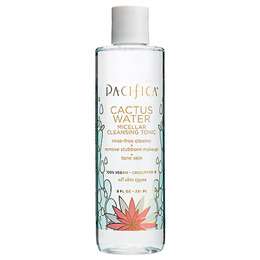 Cactus water, full of skin-loving beneficials, has a history of toning and hydrating. All skin types! 100% vegan. Cruelty-free. Formulated without animal ingredients, petroleum, parabens and phthalates. Aqua (Purified), Sorbitan Oleate Decylglucoside Crosspolymer, Decyl Glucocide, Glycerin, Cereus Grandiflorus (Cactus) Flower Extract, Citrus Grandis (Grapefruit) Fruit Water, Phenoxyethanol, Ethyhexylglycerin, Parfum (All Natural). Soak a cotton pad with micellar water and wipe over face, eyes and neck in an upward circular motion. 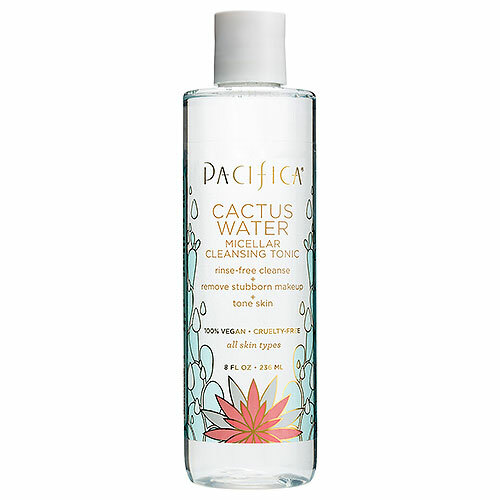 Below are reviews of Pacifica Cactus Water Micellar Cleansing Tonic - 263ml by bodykind customers. If you have tried this product we'd love to hear what you think so please leave a review. This product does the job for all but very sensitive skins; will try the coconut one next time. Powerful yet gentle, this innovative tonic water helps capture and lift away dirt, oil, impurities and makeup without harsh rubbing or even rinsing.